The Shefit Perfect Lounge Bra is a comfortable seamless bra that's perfect for every day, and great for lounging, yoga, sleeping or running errands. The Perfect Lounge Bra is so comfy, it'll replace your favorite t-shirt. The Perfect Lounge Bra is strategically engineered to give just enough lift to avoid the dreaded sag that comes with other seamless bras. Featuring an easy-on, easy-off front-zip closure and removable pads. The straps are significantly shorter by design, this makes you feel more supported and lifted than other seamless bras. Our rib band forms to your body for the most comfortable fit. The Perfect Lounge Bra is the most comfortable seamless bra... ever. The design of the Perfect Lounge Bra gives you the comfort you want from a seamless bra with amazing lift and support you expect from a Shefit brand bra. 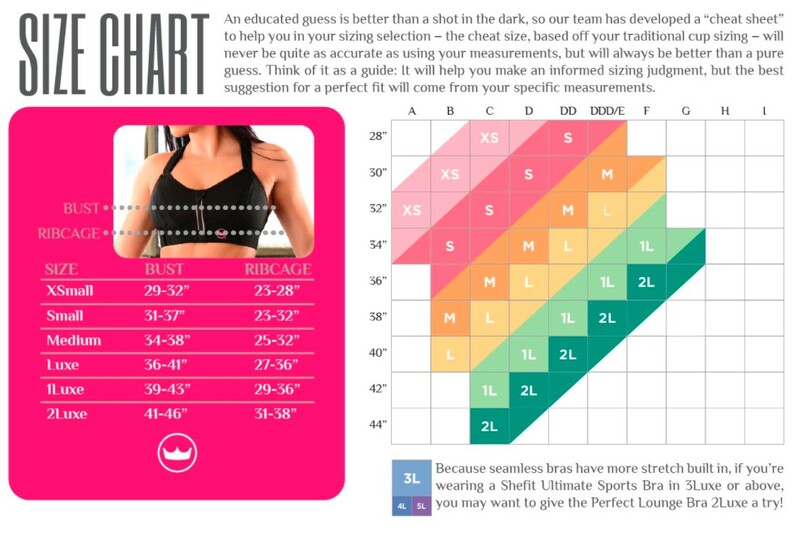 Levana Bratique comments: We have found that we can fit many more women comfortably into this bra that the size chart indicates. I personally wear a 36J and I wear the 2Luxe size in this bra. I feel supported and love the comfort!